In Greek, the name Eustace means steadfast. 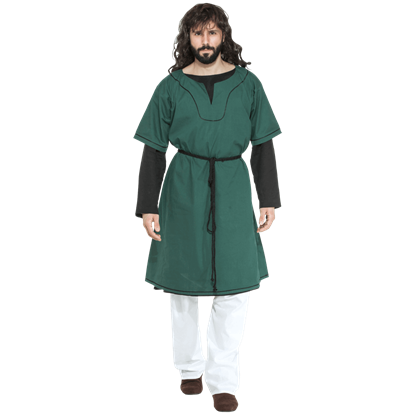 Let the Eustace Greek Tunic be a steadfast staple in your own reenactment wardrobe! 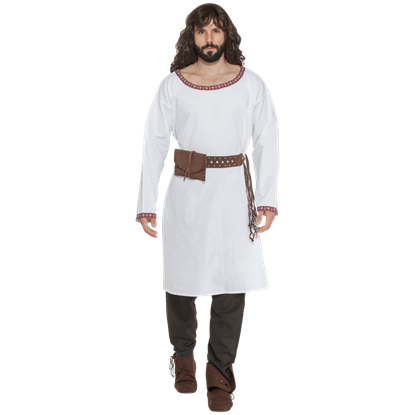 This cotton tunic is great for the ancient Greek era and can even suit medieval and fantasy settings. This short cut tunic is perfect for either the market streets or under any Greek armor. The sleeves and bottom are accented with a Greek trim which emulates the waves of the Aegean. It is made in 100% cotton. This lovely flowing gown harkens back to an age of Olympian gods and goddesses with its pure white material and golden accents. 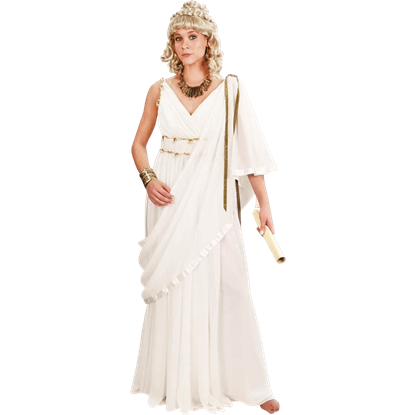 The Helen of Troy Gown will allow you to dress as the most beautiful woman of the ancient world. 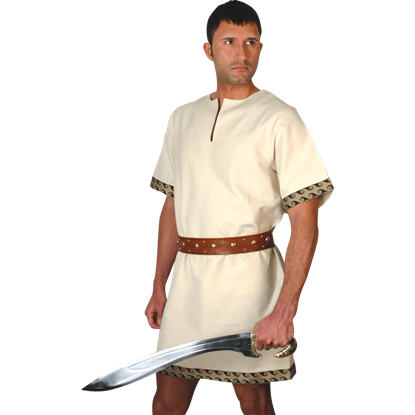 So named for the son of Theseus, the Hippolytus Greek Tunic will bring both regal and mythical style to your historical reenactment wardrobe. 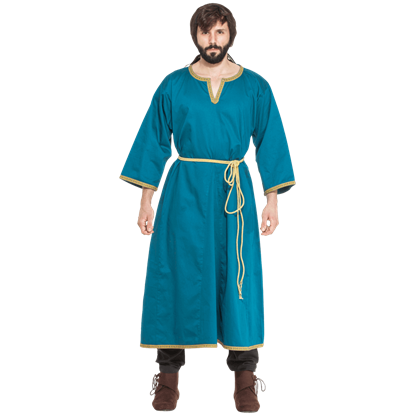 Made of a satiny cotton fabric, this mens teal tunic is trimmed with gold embroidery. Traverse the fair or stage with the elegance of an ancient Greek nobleman when you wear the Ignatius Greek Tunic. This white, 100 percent cotton tunic features stylish embroidery around its wide scoop neck and long sleeve cuffs. The Silver Greek Royal Belt is a fantastic example of a Greek and Roman tasset that many warriors would have favored. 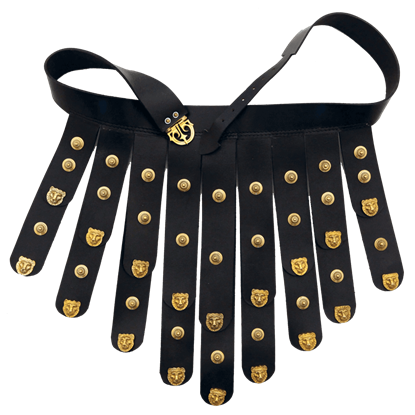 Indeed, this tasset is similar in design to the one that comes included with our classic looking Royal Muscle Cuirass! 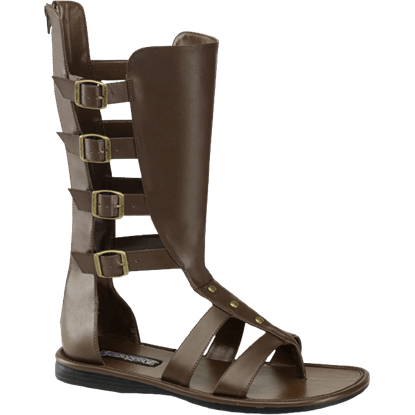 These Spartan sandals are made of all leather construction with rubber soles and three adjustable ankle straps. 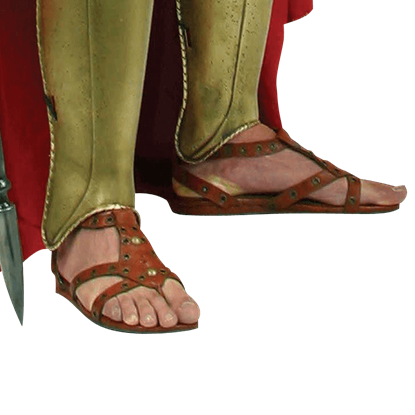 Spartan sandals are a must for the Spartan 300 outfit, or for any Greek warrior ensemble. Some of the foremost warriors of the ancient world, Spartan warriors wore items that were less elegant and more practical and comfortable. The Spartan Sandals reflect that mentality with a simple look that hides rugged functionality. Never has there been a better way to wear the confidence of a gladiator with such awesome style! March into battle or brave the world with the Womens Gladiator Flat Sandals, the perfect shoe for any summer look or Roman outfit!